Consider this a follow up to my earlier post about the Bank of England’s Mark Carney’s rescue of the financial stocks and the overall stock indices. We have reached a point where these Central Bankers can move markets at will, merely by uttering the magic words. ” PRESTO – CHANGO; ABRACADABRA! The Central Banks have plenty of tools at their disposal to combat those things which might hamper growth prospects or stock value prospects”. TRANSLATION – More liquidity – even lower rates – more bond buying, etc. The RESULT? RISK ON…time to party. 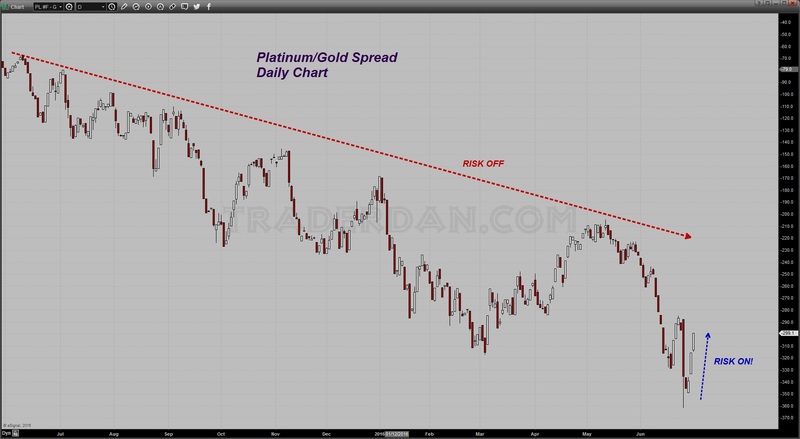 You can see this RISK ON sentiment by observing both the Platinum/Gold Spread and the Silver/Gold Spread. Both spreads are moving strongly in favor of the white/Grey metal and against gold as the safe haven metal loses ground to the RISK metal. There does however remain a great deal of confusion cross these markets with not all of the major markets that we are accustomed to seeing move in tandem no longer doing so. 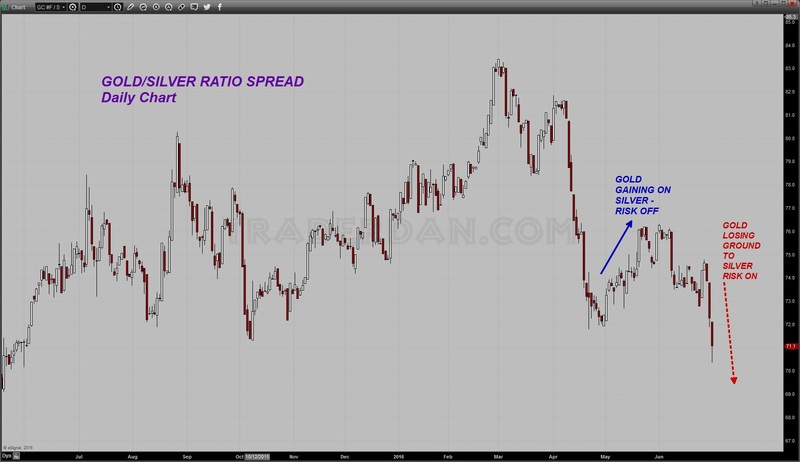 For example – Crude oil has tended to participate in any RISK ON or RISK OFF trade of late. Today, it did not. It broke down sharply and acted like it does on the RISK OFF days, not the RISK ON day that we had today. The bonds also, while they are lower, they did not fall apart once again. The Dollar – it has been moving higher during RISK OFF or SAVE HAVEN days. Today, it moved higher during a RISK ON day. Copper is moving higher – which is pure RISK ON since the copper fundamentals have not changed one bit since Brexit. My point in all this is that every single bit of this can, and will reverse, on a moment’s notice depending on the fickle mood of the hedge fund computers. Do not extrapolate too much from these movements. Respect the chart action and try to stay on the correct side of the trade based on the indicators that you trust but be ready for any sentiment shift. As noted previously, now that the Brexit vote is out of the way, the VIX has promptly collapsed and traders are completely complacent again it would seem. The new pattern is that we get some sort of negative event as far as the markets are concerned, everything gets sold off except for the safe havens; the Central Banks make all kinds of soothing noises; the markets then buy back everything they sold and then everything returns to normalcy again as we await the next crisis/event. Meanwhile, the lemmings who have been trained to buy stocks every single time they sell off, get repeatedly rewarded for doing so even further reinforcing that kind of reflexive behavior. The idea that stocks might reach some point where a potential for continued selling ( AKA BEAR MARKET) could actually occur never once enters their mind since the almighty Central Bankers are there to preclude such stressful events from ever impacting the tender feelings of the investor/trader that needs to be protected from such things. If you are reading this and coming away with the sense that I am filled with nothing but disdain for these meddling, pestilential Central Bankers, you are correct. We somehow have arrived at a point in Western Civilization that these elitists believe it is their God-ordained right to interfere with the free market system. Isn’t it interesting that when Crude oil prices were plunging to $26 and the entire oil patch was reeling, all we heard from this group was how low energy prices would be transitory and would benefit the consumer and business. Let the bank stocks get to reeling and boy howdy, this group springs into action. Protect the banks no matter what is the motto. Of course, it is not possible for stock market rallies that DO NOT INCLUDE BANK STOCKS RISING to last, that is why the financial sector needs its government nursemaids. Let the energy stocks fall however and there is nothing but silence. One sector has powerful friends; the other does not. One sector is loved by Central Bankers; the other is not. I am beginning to wonder if it is even possible for a bank to fail in this brave new world of ours. Not that I am wishing it but the moral hazard that has been created by the attitude among Central Bankers towards banks in general must inevitably give rise to laxness and carelessness when it comes to risk taking by banks themselves. After all, if one understands that they are “TOO BIG TO FAIL” then the tendency will be to get aggressive when it comes to risk taking and throw caution and prudence out the window in the quest for ever higher profits. None of this would be near as likely in a world free of Central Bank interference where only those companies that ran a good balance between risk taking and prudent business practices could endure the ups and downs of the economic cycles that come and go. It seems to me that Central Banks, and most political leaders who condone this sort of meddling, have as their nirvana-like goal, the desire to achieve some sort of permanent prosperity without any sort of adversity whatsoever. Such is not possible in a free market, where some are rewarded and others are not. Enter the modern CB who in their hubris believe that all things are indeed possible if only the right people are at the helm of the ship of monetary state. And thus we have what we now have…. interest rates in negative territory financially murdering savers and retirees all the while urging, encouraging and even prodding more and more risk and more and more leverage, all in the hope of squeezing out or eking out what meager gains are available for those who seem oblivious to the danger of excessive leverage. There is indeed nothing new under the sun… men never learn do they?